When it comes to selling your home and getting the full selling price you want, there are certain tactics and methods you can employ to ensure that this wish becomes a reality. Avoiding the commonly made mistakes that end up lowering the value of your home and discouraging people from viewing it is ultimately the key in getting top dollar, as well carrying out the showings and sale of your home in a professional manner. Listen to the professionals, and make sure you employ these real estate sale methods to get your desired number on your home sale. As strongly as I feel that we should always avoid overpricing, this particular tactic is, of course, dependent on the type of market you find yourself in, right down to the neighborhood. A common, and sometimes successful tactic in getting the price you really want for your home, is adding a little buffer to the list price. If you expect to sell your home for $500,000, you may want to list your home between $510,000 and$520,000 to allow some negotiating room. Even if you’d prefer not to negotiate, the majority of buyers will always assume that you have room to come down on the price, and will submit their Offers accordingly. I know, it appears that I’m talking out of both sides of my mouth with this one but, bear in mind, you don’t want to overprice your home to the point that you discourage potential buyers from even looking at it, or to put your home outside of a financial (search) bracket. Make certain that you speak to your trusted real estate advisor with regards to the exact list price that you will need in order to obtain your desired value. In order to get the price you want for your home, you need to make a good impression on the prospective buyers. Having your home professionally staged can dramatically increase the amount of interest you receive on your home, perhaps even creating a multiple Offer situation – which is the best situation a home Seller can be in! With nearly 100% of today’s modern real estate shopping happening online, you want to ensure that your home has a strong online presence. The BEST way to accomplish this is with price, staging and finally, with professional photos and a floor plan available to the prospective buyers. Also make sure that all information online is full and complete, and presents your home in the best light possible. If you put these tactics into your home selling plan, you will find that it will be much easier to obtain more interest from buyers. And with more interest, it will be much more likely that you will be able to obtain the price you want for your home. So don’t underestimate the importance of these factors, and discuss them today with your trusted real estate professional. 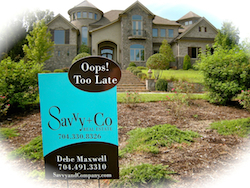 For more helpful tips and info about listing your Charlotte home for sale, contact me at (704) 491-3310 or email me at SavvyBroker@me.com. List your Charlotte home with top agents who get our listings SOLD in half the days on the market AND for more money than others. Get YOUR Charlotte Home Sold in Half the Days on the Market AND for More Money!